On February 15, 2013, a small incoming asteroid created a meteor – brighter than the sun – over Russia. It exploded in the air over the city of Chelyabinsk. Six years ago today, a small asteroid with an estimated size of 65 feet (20 meters) entered Earth’s atmosphere. The February 15, 2013, asteroid was moving at 12 miles per second (~19 km/sec) when it struck the protective blanket of air around our planet, which did its job and caused the asteroid to explode. The bright, hot explosion took place only about 20 miles (30 km) above the city of Chelyabinsk in Russia and carried 20 to 30 times the energy of the Hiroshima atomic bomb. Its shock wave broke windows and knocked down parts of buildings in six Russian cities and caused some 1,500 people to seek medical attention for injuries, mostly from flying glass. Large and small bodies from space strike Earth’s atmosphere continuously. The Nuclear Test Ban Treaty Organization, which operates a network of sensors that monitors Earth around the clock listening for the infrasound signature of nuclear detonations, said in 2014 that it had recorded 26 atom-bomb-scale asteroid impacts to Earth’s atmosphere since 2000. Still, the February 15, 2013, Russian superbolide was extremely powerful. It was later said to be the most powerful explosion caused by an asteroid since the Tunguska event, which flattened a wide area of forest and killed reindeer in Siberia in 1908. The Tunguska event happened in a sparsely populated part of Siberia. It remained mysterious to scientists throughout the early part of the 20th century. By contrast, across a wide swath of Russia on February 15, 2013, dashboard cameras and amateur photographers captured images of the incoming meteor. 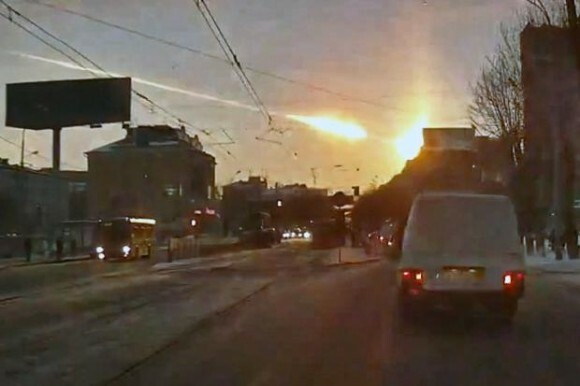 Bright fireball over Russia on the morning of February 15, 2013. Scientists later said the light from the meteor was brighter than the sun. It was visible up to 60 miles (100 km) away. Vapor cloud trail left by the Chelyabinsk, Russia, asteroid as captured by M. Ahmetvaleev on February 15, 2013. Image via ESA. After the 2013 meteor exploded, it’s said that local residents and schoolchildren found meteorite fragments left in its aftermath, many located in snowdrifts. An informal market emerged for meteorite fragments. 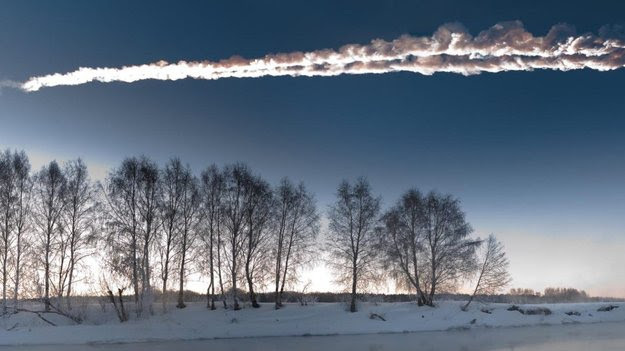 A large number of small meteorites fell on areas west of Chelyabinsk, and, within hours of the visual sighting of the meteor, a 20-foot (6-meter) hole was discovered on the frozen surface of Lake Chebarkul in the Russian Ural Mountains. Scientists from the Ural Federal University collected 53 samples from around the hole that same day. In June 2013, Russian scientists reported further investigation by magnetic imaging below the location of the ice hole in Lake Chebarkul. They had identified a larger meteorite buried in sediments on the lake floor. Following an operation lasting a number of weeks, on October 15, 2013, a large fragment of the meteorite was lifted from the bottom of Lake Chebarkul. 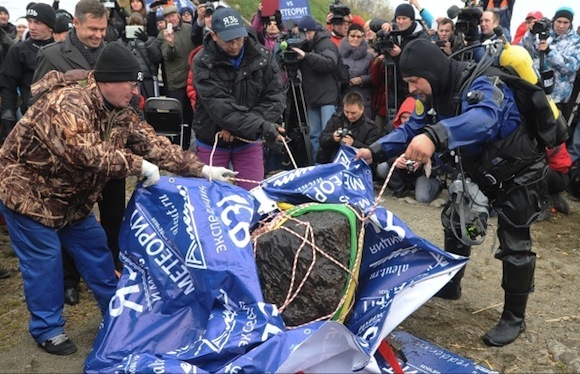 It had a total mass of 1,442 pounds (654 kg) and to date remains the largest found fragment of the Chelyabinsk meteorite. Largest-discovered fragment of Russian meteorite, lifted from the bed of Lake Chebarkul in the Urals, via Voice of Russia. NASA satellites were also able to track the meteor plume in Earth’s atmosphere. As the video below describes, they tracked and studied the meteor plume for months. Bottom line: On February 15, 2013, a small asteroid created a bright meteor over Russia, which exploded over the city of Chelyabinsk.